With over 1000 traditional and modern worship songs, this is the most comprehensive collection from the Mission Praise series, and a wonderful compilation of joyful, musical praise. Mission Praise has been the No.1 bestselling song and hymn book since it was first published in the early 1980's. Complete Mission Praise brings all the songs and hymns from the entire Mission Praise Collection into a comprehensive volume of worship material that will satisfy the needs of all Churches and congregations. This new edition contains 100 extra songs, bringing Complete Mission Praise entirely up-to-date. Both traditional favourites and contemporary reworkings are included, making this a comprehensive collection of the UK's best-loved worship songs. 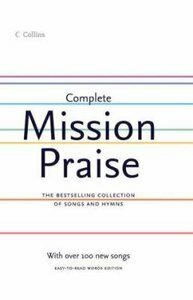 About "Complete Mission Praise (Music Book) (Easy-to-read Words Edition)"